This is Rio 12 gauge 2 3/4" Brenneke Slug ammo. These shells feature the Brenneke slug design, which provide deeper penetration and greater weight retention since they are solid. 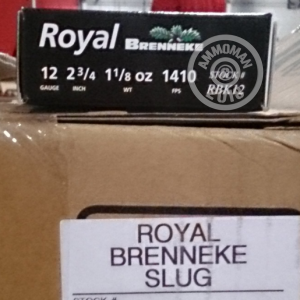 The Brenneke style slug also has sharp shoulders and a flat front, limiting its effectiveness to short-range use. This ammunition, fired at 1410 fps, is extremely powerful and will help you take down the big and dangerous game. Rio now has a manufacturing facility in Marshall, Texas to provide ammunition to the U.S. market. This plant's focus is 12 and sub-gauge target and hunting ammunition. Pick up a case of the shells today to get free shipping on your order over $99!